St. Valentine's Day began as a celebration of one or more early Christian saints named Valentinus. It is believed that several martyrdom stories were invented for the various Valentines that belonged to February 14th. Nobody knows exactly who St Valentine was, although the most popular myth amongst historians suggest that he was a Roman martyred in the third century AD by a Roman Emperor. It is said that the imprisoned Duke of Orleans sent the first recorded Valentine’s card in 1415. It is believed that he sought solace from his confinement by writing love poems to his wife. Valentine’s Day, or its equivalent, is now celebrated in many countries around the world. However, the traditions often differ from place to place. In Japan it is customary for the woman to send chocolates to the man. Whilst in Korea April 14th is known as ‘Black Day’. This is when the unfortunate men who received nothing on Valentine’s Day gather to eat noodles and seek solace with each other at the local eatery. Why not make Valentine’s day special with a unique and loving Valentine’s gift for him or a Valentine’s gift for her, from Brilliant Wall Art. There are many Valentines gifts, heart wall art, loving signs, love sculptures, love doves and porcelain round heart/dishes. I particularly like the stylish aluminium love bookends with a polished aluminium finish, featuring the word love design detail. These are a must have for any romantic book lover. Just the thing to keep my copies of ‘Ghost’, ‘Brief Encounter’ and ‘fifty shades of Grey’. Have you lost the romance in your life? So don’t hesitate, buy your heart gifts today at Brilliant wall Art. 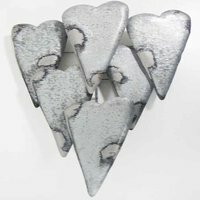 Metal wall art sculptures at Brilliant Wall Art, are the vogue way of brightening up any room. Choose from our stunning range featuring colourful, creative and unique designs. If you are a fan of classic, modern or contemporary large metal wall art, we can guarantee you will find the perfect pieces to complete any room. Simply contact our team with details of the store or Website that you have seen the product(s) at a cheaper price and let us do the rest.